My experience on wildlife research and participatory wildlife conservation programs in Nepal adds up to more than two decades. 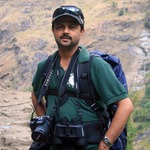 I am voluntarily serving as country representative of World Owl Trust and Research Associate of the Global Owl Project for the conservation of owls in Nepal. I have conducted research on wolves, vulture, owls and other carnivore species of Nepal. I led the team that rediscovered wild yak Bos mutus and member of the team that recorded Asiatic golden cat Pardofelis temminckii in Nepal. I have published five peer reviewed scientific articles and four conservation books/booklets (local language) on birds/mammals of Nepal. Despite all these, I am mostly focused on owl conservation issues. I have been actively working for owl conservation, through Nepal Owl Festival, conservation camps and other similar activities, since 2008. I am also the co-author of two books on owls, "Latokosero ki Batokosero" and "Owls of Nepal", the first of its kind from Nepal. My experiences ranges from wildlife research, participatory conservation as well as in publication of conservation materials. Hence I believe I can efficiently lead to achieve the aims of the proposed project.